I was experimenting the other day and decided to make savory muffins for the kids because they seem to bounce off the walls with the chocolate chip ones! Also my son prefers savory stuff so I thought I’d try these out. 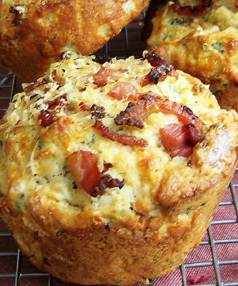 Quite simple to make and feel free to add extra bacon bits! Cook the bacon bits in a pan until crisp. In the interim, mix all the other ingredients in a bowl. Add the bacon and mix well. Spoon the mixture into a 12 cup prepared muffin pan (I actually lined mine with cupcake cases to make life simpler) and bake in the oven at 180°C for 20-15 minutes. I found that I could have added extra cheese and you can never ever go wrong with extra bacon bits. In the second batch I ground some black pepper into the batter and those turned out quite well too. Let me know how you fare with your attempt! Previous ARE YOU A SOBTIAN? Happy to hear that Harvinder! Will try and post more easy recipes. I try and test each and every one of them before posting them here.